I figured I have procrastinated enough…. I have finally started tackling the sewing room. 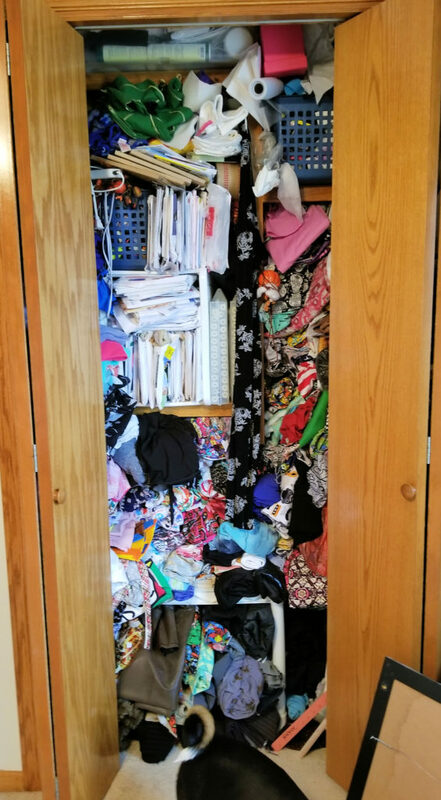 After going through YEARS of Burda and Ottobre (with a few KnipMode, Patrones, and Japanese pattern magazines thrown in), I decided to tackle the hardest part – the stash. The fabric extends past the doors and up the wall, too, which the photo doesn’t really show.. don’t judge. LOL I decided to tackle this by making piles: “Definitely Keep”, “What Was I Thinking”, “Scraps”, and “Maybe”. Of course, it’s now too late to turn back because I’ve started making a HUGE mess. The most recent fabric purchases made it into the “definitely keep” along with fabrics that have been earmarked for particular projects, good “basic” fabrics, and prints that I just love. I also sorted them into knits and quilting\home decor cottons (which aren’t shown above). The bulk of “What Was I Thinking” seemed to be bundle purchases. You know how Fabric Mart does those fantastic deals for suitings, denim, fashion knits, where you got 10+ yards of material for a great price? Yeah, I loaded up…. then didn’t make a dent into sewing them. Other pieces were largely fabrics that were either impulse buys or designs that just look dated now. I also went through a “silky print” phase because I had YARDS AND YARDS of that kind of material. I keep a lot of remnants. If it’s a quilting cotton, I kept it because there are sometimes little projects that call for contrasts or a fun print (or maybe some day I WILL make that scrappy quilt).. or sometimes I’m just testing out a pattern and need something on hand to see if my measurements were correct. I also tend to keep knits as well with the idea in mind that I can make a fun pair of underwear, some contrast sleeves, etc. With that said, my “Scrap” pile was out of control. I wound up with 2 trash bags full of cotton scraps that I donated to a friend that is taking them to the quilting ladies at her church (I hope I see some of those pieces in something some day). As for the knits – if it was around a yard, I decided to donate it. I will say that I kept a handful (about 5 or 6) prints because I still have ideas, but otherwise the bulk is gone. The “maybe” pile was a lot smaller than what I expected. I really went in with the idea that I either love it or hate it. Most of what went into the “maybes” I didn’t wind up keeping. I’m still not quite done with this. 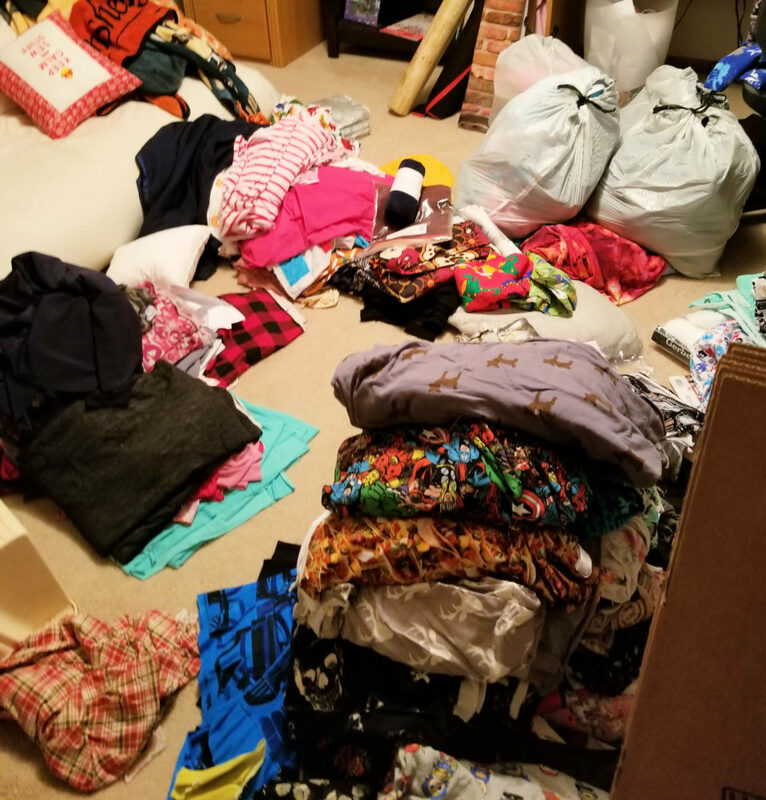 All the fabric is either in bags (a few have been donated – I’m sure they think someone died because there was quite a bit I took in) or still on the floor, not to mention the fact I still have an entire cutting table to sort through. But the hardest part is done. I’m not going to lie, this was a struggle – not just because of the sheer volume I dealt with, but because there is some sort of ‘sentimental attachment’ to some of these materials. As I unearthed fabrics and scraps, I reminisced about what I made with each (I even unearthed material that I had used for a Christmas dress for Taylor when she was 3… she’s 21 now! ), so it was a fun journey through sewing time. Now I’m anxious to get things back into place this weekend and start fresh! As a side note, if you live in Wichita and need some Burda magazines, let me know… I have numerous years worth that you can sort through before I drop them off. This entry was posted in Uncategorized on January 18, 2019 by stacy. I have just done a major purge and refolding of my fabric. I also have quilting and clothing fabric. I folded all the quilt fabric on a 6″X24″ ruler, then folded in half. These went in clear plastic bins according to colour. the clothing fabric was folded into 15″ squares (approx.) as it sits nicely stacked on my shelf. I can now see everything that I have. Patterns have been stacked in clear shoe boxes, standing up, so no lid on the box. All my indie patterns that I have printed as pdfs are in brown envelopes with info written on the front and files in recycling blue boxes from the dollar store. Now I can sew again 🙂 Best of luck with the tidy up. I just did this too – definitely makes a bigger mess while you are in the midst of it, but is nice to have done. Good luck!